I love design with a deeper meaning… Here are a few logos worth taking a second look at! Awesome talk by a design legend… Moral of the story? DO WORK. via Milton Glaser’s Advice to Young Artists. Well, guys, I did it! It’s a done deal! 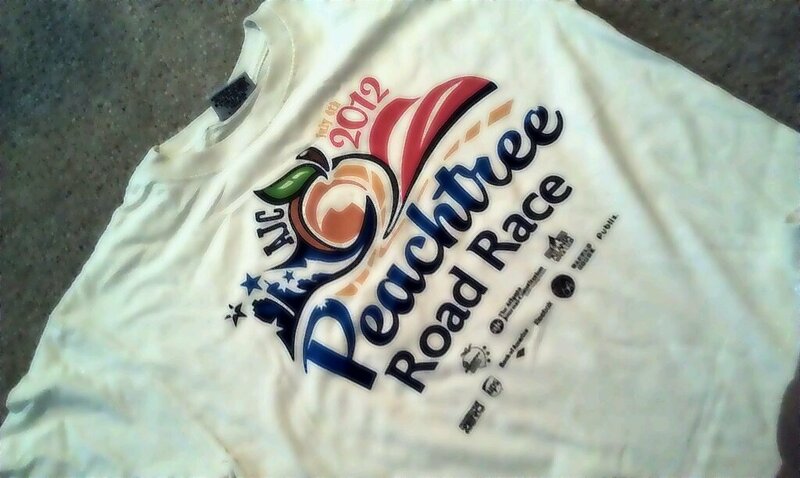 The 43rd running of the Peachtree Road Race has been completed and I’ve got my finisher’s shirt to prove it! Today was an awesome experience that I’d never imagined myself participating in… Running 10k race has never been a dream of mine. But, I see why people do it! I’m no runner but I’m always up for a challenge and I think that’s the aspect that drew me. 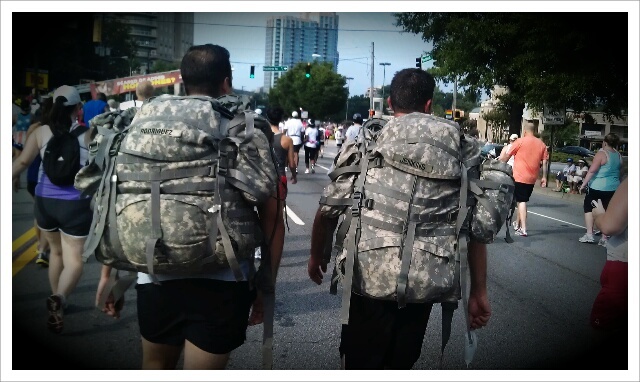 (And speaking of challenges…) These two are my heroes of the day! I don’t know their ranks but Jenkins and Rodriguez were definitely forces to be reckoned with! They KILLED the course while running fully loaded down with their military paks. It was inspirational, to say the least, and kept me moving when I was ready to slow down. 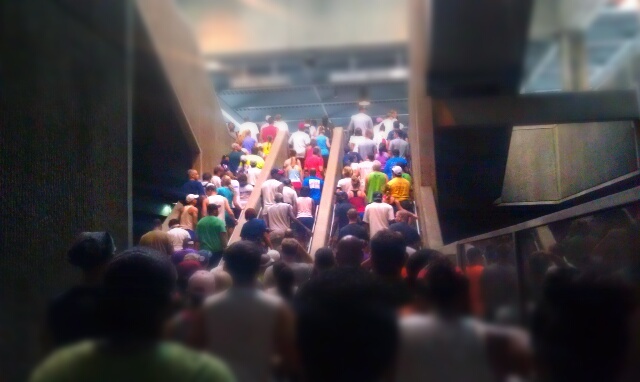 This was what it looked like in every direction… Just a sea of bodies. While everyone was focused on the task at hand (breathing, dodging people, not falling…) there was still a lot of consideration and encouragement amongst my fellow runners. As I passed Mile 5, I slowed from a jog to a brisk walk. A guy behind me called out, as he ran by, “Nuh uh, come on! Don’t lose your momentum! 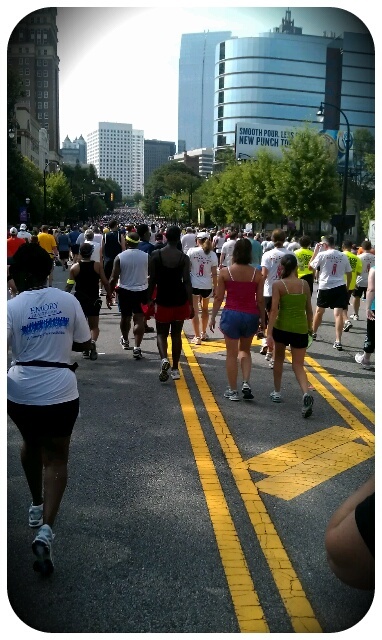 We’re almost done!” That small act of kindness really encouraged me and I picked up my jog and finished out the race. In the end, my race time was 1:27:50. Considering the winners from the first waves finished in like 27 mins, that time isn’t really anything to brag about but, hey! I have an official time meaning: I finished! 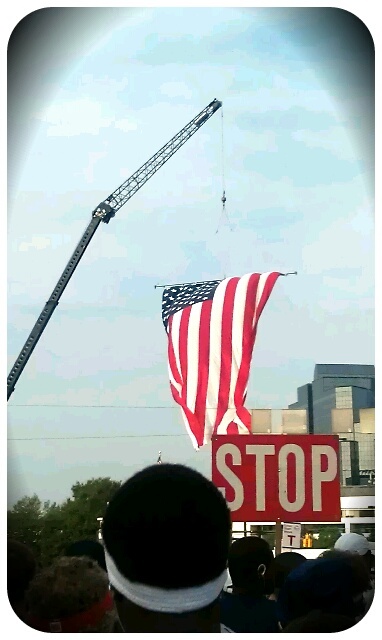 That was the only objective from the beginning and as of July 4, 2012, mission:complete! Congrats to everyone else who braved the masses and the road with me today! It takes a lot of persistence and determination to successfully prepare for a race like this so to you, along with the brave men and women of our armed forces who make this day even possible, I salute! Be safe and enjoy this time with friends and family! Happy 4th of July! 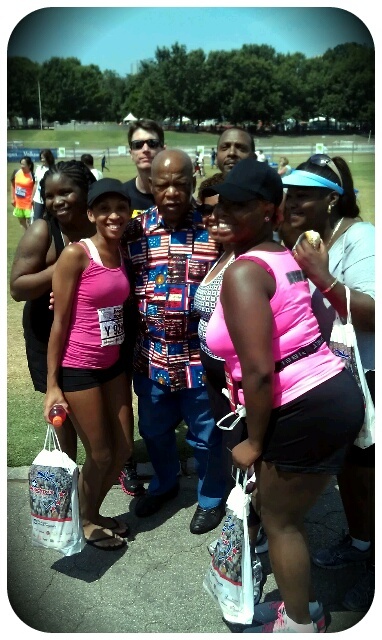 Oh, and, as we were leaving Piedmont Park, I looked up and there was Congressman John Lewis congratulating US on our accomplishment! He graciously agreed to a picture and patiently waited as we dealt with incoming texts, dying phones, and all other sorts of camera drama… Lol. How cool is this! ?